As the children are back to school. It may be time to schedule the treatment you have been putting off. Please call the office to see what you have remaining for benefit’s. The year will be soon coming to a end . You want to make sure that you use all your remaining benefits for the year. We are doing a coat Drive in Braintree this year to benefit the Marge Crispin Center. Feel free if you would like to drop off any coats in the office, we will accept any donations from children to adult . We are also doing a food drive for Thanksgiving. Any canned goods stuffing mix, pie mix etc. will be accepted this will also benefit the Marge Crispin Center. All donations for coats and food need to be in the office by November 16. We have celebrated many Birthdays in the office over the last few months . We have added a new team member to the front desk. Welcome Katherine !!!! We want to thank our patients for their generous donations to the smiles for life campaign . To date we have $2,485. The Marge Crispin Center in Braintree will receive half of the donation. The center always puts the money to good use they do lots of things in the Braintree community to help the families in need. Barb attended Braintree’s annual 4th of July celebration which was held on Saturday June 30. There was a parade and we set up a booth at Braintree High Schools Carnival celebration, we handed out lots of goodies, Dudley our tooth brushing dinosaur is always a big hit with the little ones. Please see our face book page to see lots of great pictures of the event. We also had drawings for a adult electric tooth brush and a children’s electric tooth brush. The winners were quite pleased we hope we will get a few new patients from the event. Employee’s for the month of June are : Kathy M and Hong E.. Congrats ladies !!! A special congratulation’s to one of our team Nayanh B. She has graduated from Massasoit Community College with her associate’s degree in Liberal arts!!!!!!!! She will be attending Bridgewater State in September to work on her Bachelor’s Degree!!! Barb and Whitney attended South Shore Health and wellness fair on Friday March 30. Many people stopped by our booth and inquired about our dental practice. We handed out lots of information and hope to have several new patients soon. The children had fun brushing Dudley our tooth brushing dinosaurs teeth .Please visit our face book page to see the pictures taken of the event. The smiles for Life whitening your teeth for charity will be going on until the end of June. please call the office if you are interested in whitening your teeth for charity. We want to thank our patients that have already participated in our campaign. The Annual Smiles for Life Charity Event is here! You get professional teeth whitening with 100% of your donation going to local and international charities. Please call the Braintree office to make your appointment today. Please Contact our Office as our Smiles for Life Campaign kicks off tomorrow March1st. A huge congratulations is in order for our own Dr. Townsend! He was named “Associate Dentist of the Year” at our annual doctor’s award ceremony. The award was given in recognition of his clinical excellence, quality care, and patient satisfaction. Join us in congratulating him! We’re honored to announce that Dr. Irwin was recognized for her achievements in clinical excellence and patient care. Of all the associate specialists in our organization, she was selected as one of the best! Join us in congratulating her!! The winner of our January contest guess how many snowball’s are in the jar is – Joe M congratulations!!!!!!! Your guess was off by one snowball. Dr. Thaker and Barb visited Gentle Dental in Braintree for a lunch and learn. She discussed infant oral care. A child’s first visit to the dentist the prevention of caries and an overall review of pediatric dentistry. As 2017 has come to an end Great Hill Dental has had a great year with many highlights that have happened . Please visit our Facebook page to see all that has happened milestones that we have been reached and the FUN the office has had. We would like to thank our wonderful patients our Fabulous Doctors and Team Members for a WONDERFUL 2017!!!! NOW ON TO 2018!!!!!! As the end of the year is fast approaching take a moment to reflect back on all the positive events that have happened in your life. Enjoy the moments with your friends and family. Do something kind for a co-worker without them knowing. It is the season of goodwill and cheer!! We still have many openings for you to get your cleanings done. Please call the office. Great Hill Dental Braintree would like to extend our warmest wishes during the Holiday season to all of our patients and staff. The winner of our candy corn contest and winner of the electric tooth brush is Lucas B. He won by guessing the exact amount which was 1003. Way to go Lucas!!!!! Dr. Salem, Dr. Goodman, Whitney and Ashley. We had ,cake to honor their Birthdays we wish them many more. Employee the Month October: Kelley thank you for every thing that you do!! With the end of the year right around the corner, we want to remind you to take advantage of your dental insurance benefit. Most dental insurance company’s do not let you roll over/carry over your insurance benefit into the new year. With that in mind, you may want to consider what remaining insurance benefit you have by contacting the office. Use it or lose it!!!. We had a very interesting day on 08/10/2017 Braintree had its Soak the Doc day as we reached our Smiles for life goal for 2017!!!! The Braintree team was armed with super soakers!!!! Dr. Goodman was our victim!!!! Please see attached video showing the events!!! 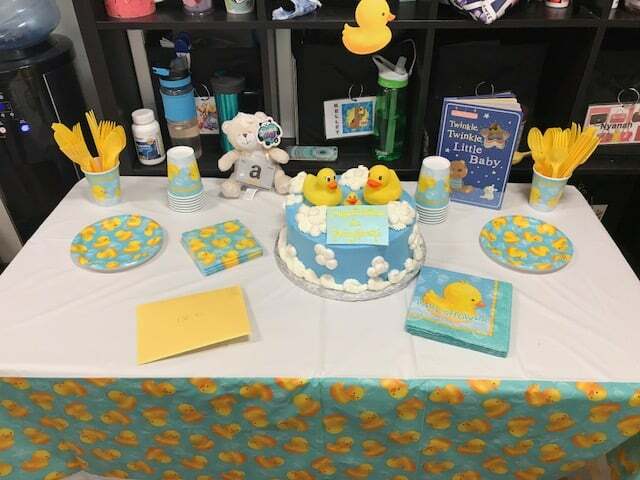 We also had a baby shower for Dr. Konieczkowski on August 17, 2017. 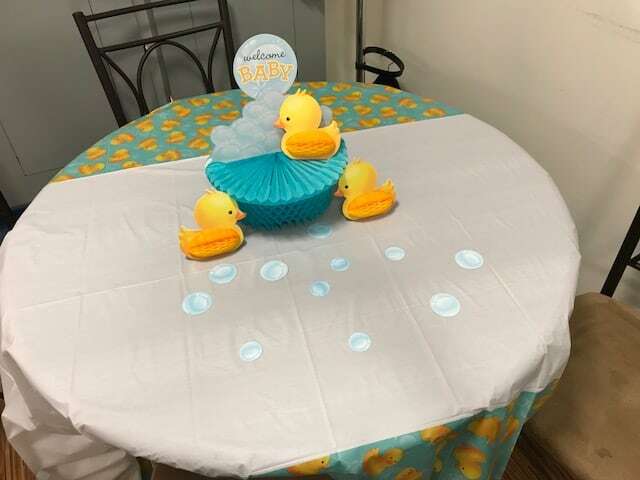 She was very excited as we kept it a secret and she had no idea until she walked into the break room where we had a buffet lunch set up with decorations and a beautiful cake. The grand total from the smiles for life campaign that is going to our local charity the Marge Crispin Center in Braintree is $4,715. The Braintree team presented a check to them on 09/14/2017. Please check our facebook page for the presentation. They were thrilled! they will be putting the money to great use in the Braintree area to help many families in need. It was our pleasure to be able to help such a wonderful organization. We are currently running an Orthodontic Summer Promotion!!!! Please call the office to receive details. In order to take advantage of this promotion treatment must be sech’d and financial agreement signed by 09/16/2017. There is still plenty of appointments available. Do not hesitate to call. Smiles for life update!!!! The Braintree location raised $9,300.30!!!!! Amazing!!!! A shout out to our amazing Patients and Staff!!!! Employee of the Month of July is Brittany. Smile’s for life campaign has come to an end . We extend our appreciation to all of our amazing caring patients. We do still have a couple of remaining appointments to be done before we get the final total for the charity, Half of the donation is going to the Marge Crispin Center in Braintree, the other half is going to the smiles for life campaign. We will be soaking the Doc, as we achieved our goal that was set in early March. Please stay tuned as we will be posting the video to our Face Book Page!!! A Special Shout Out to all of our Amazing staff for all of their hard work and extra effort !!! you are all AMAZING!!! With it being summer holiday please call the office to schedule any treatment that needs to be done for yourself and any of your children. Our smiles for life campaign is doing awesome We extend our gratitude and thanks to all of our caring patients. To date, we have raised $6,222 dollars. As we head into the summer months it is time to make sure you have scheduled your children’s cleanings and any restorative work that needs to be done. Also, it is a great time to get your teeth whitened there is nothing that looks more fabulous than a bright smile!!!!! Do not hesitate to call the office we will find the perfect time for you that will fit your busy schedule. We also have openings in our Orthodontic schedule if you are thinking of starting your children’s braces during the summer months. Wish that dental procedures were fast, easy and painless? Welcome to the new age of dental solutions! The unsightly look of receding gums can now be corrected in under an hour with the Chao Pinhole® Treatment. Only specially certified dentists can perform this procedure, and Great Hill Dental Braintree’s Dr. Goodman has obtained this certification. Call to schedule a free consultation! Flossing before brushing your teeth or after? Great Hill Dental Braintree’s Dr. Goodman says you should floss BEFORE you brush. This helps to get the plaque out so the fluoride from your mouthwash and toothpaste can get between your teeth! If you are interested in the Pinhole® Gum Rejuvenation or want to ask Dr. Goodman about sensitive teeth or receding gums, call Great Hill Dental Braintree at (781) 848-4041now to schedule your complimentary consultation. All procedures scheduled before the end of May, will receive $500 off your Pinhole® Treatment courtesy of Dr. Goodman! Dental Assistant Appreciation Week was celebrated in Braintree. We thanked our hard working dental assistants with beautiful flowers and lunch from the Cheesecake Factory. The Smiles for Life Campaign is in full swing . This is a win-win for our patients and local charity, The Marge Crispin House. The Braintree Location has raised $1,585 to date . Please do not hesitate to call our office and schedule your appointment today. 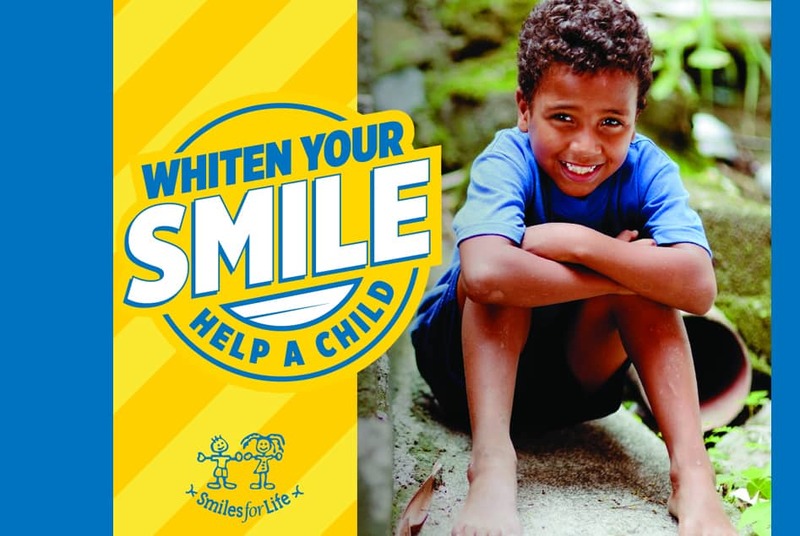 Whiten Your Smile and help a Child. The office is still doing well with our healthy Choices. To date the staff has lost a total of 115 lbs. We still continue to encourage one another thru this journey. Birthday wishes for March go out to Rachel and Kelley. Employee of the month for March is Sochita. The office is preparing for the Health Care Fair which is on Friday April 28th at the Emilson YMCA in Hanover from 9:00 to 1:00. Great Hill Dental will have a booth where can ask dental related questions. One can also have the opportunity to enter in our raffle give away. Dr. Thaker our Pediatric Dentist will be present as well. She will be able to answer any questions in regards to your children’s dental health. Its always Sunny ​in Braintree! Great Hill Dental Partners Braintree is once again teaming up with Smiles for Life to whiten smiles for charity. Every penny benefits the Smiles For Life charity organization, as well as our local charity, Marge Crispin Center. Opalescence donates the whitening kits, and we donate our time and resources to ensure children in Braintree, MA and around the globe keep on smiling. Stop by our office or give us a call for additional details. We can’t wait to see you smile! Our Office Managers attended The Crown Council team building event in Nashville Feb 2 thru Feb 4th. The days were filled with seminars and other fun filled activities. They were able to bring back much information to share with the office. The staff enjoyed a nice Valentine day celebration on Feb 14. Please see our facebook page for pictures of the day. Several of Great Hill Team Members have decided to take on a healthy approach to the new year. As of the end of February, the dieters weigh 88 lbs less!!! We continue to encourage each other as we take on this challenge. Every Month I will keep you updated on our progress. Employee of the month for January was Rachel. Employee of the Month of February is Whitney. Thank you to Rachel and Whitney for their great contributions! Stay tuned we will be kicking off our smiles for life campaign in March , you will be able to Whiten your smile and help a child. Please call the office and we will be able to go over all the details with you. As we start off the new year with our new goals in mind. We strive to always achieve great patient care so patients will repeat and refer!! We are looking forward in the upcoming months for our Smiles for Life Campaign!!! This is a win-win for our patients, our local charity – The Marge Crispin House, and The Smiles for Life charity. We actively have a waiting list for this year’s campaign. We hope to exceed last years total. So please make an appointment for your bleaching!! Welcome our new patient acess rep Nyanah. You’ll see her welcoming smile as you enter the office. Also, welcome back to Ashley who has re- joined our Braintree staff as a dental hygienist. WAY TO GO PATRIOTS!!!! SUPER BOWL 51 CHAMPS!!!!!! Happy Birthdays to our December Birthdays, Abby and Lorena. We wished them many more. The employee of the month of December is the Entire Great Hill Dental Team!!! We want to thank our entire team for all their hard work!!!!! We had a very successful Toy Drive to benefit the Marge Crispin Centers Annual Toy Drive. Our year end dinner was held at Amelia’s on December 9th. Fun was had by all. 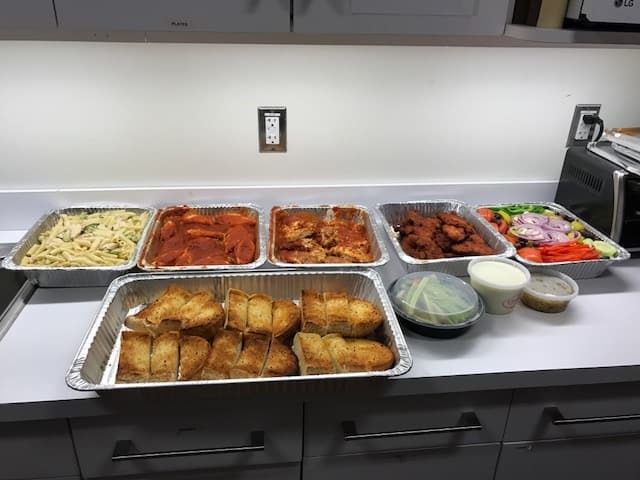 On December 23rd, the doctors provide a lunch buffet from Cheese Cake Factory. We also had a Yankee Swap and an ugly sweater contest. We had a lot of fun and the food was delicious. Please see our Facebook page for photos of the events! We are very lucky to have a new team member in Braintree. Welcome Whittney!!! As the year winds down we can reflect on the accomplishments that Great Hill Dental has made as a practice and as a Team!! We can look forward to the New Year with pride and excitement! As we end 2016, we welcome the New Year of 2017!!!! We are very happy to welcome Dr. Pitluck to our Great Hill Dental Braintree Family !! Happy Birthday to Sochita, our November Birthday. We wish her many more!!!! The Employee of the Month for November is Rachel. Thank You Rachel for all you do! Thank you to our dental team for the generous contributions that were made to our Thanksgiving donation box for the Marge Crispin center. Dave & Busters was the location of Great Hill Dental Braintree’s Team Building Event on November 30!! We were split up into three teams. There was a mad dash event. A brain teaser event and try to name all 50 states in a minutes time. All three teams were in a couple of points of each other at the finish!!!! However team #3 came out the Victors!!! There was fun midway game playing enjoyed and great buffet!!!! See our facebook page for the fun pictures that are posted for the event. All enjoyed and worked together as a team. We are so excited to offer the Affordable Smiles Dental Plan . This is a plan tailored to our patients that do not have dental insurance. For one low annual fee, You’ll receive. Speciality dental treatment such as periodontics, oral surgery and more when paid in full at time of service. Annual 12 month plan begins the day of sign up. All plan benefits are available only at Great Hill Dental Partners Location. With the end of the year right around the corner, we want to remind you to take advantage of your dental insurance benefit. Most dental insurance companies do not let you roll over/carry over your insurance benefit into the new year. With that in mind, you may want to consider what remaining insurance benefit you have by contacting the office. Use it or lose it!!! Dave & Busters was the location of Great Hill Dental Braintree’s Team Building Event!! We were split up into three teams. There was a mad dash event. A brain teaser event and try to name all 50 states in a minutes time . All three teams were in a couple of points of each other at the finish!!!! However team 3 came out the winners!!! There was fun midway game playing enjoyed by all as well!! Every one enjoyed and worked together as a team. The Fall has arrived! And with it, a new addition to our office staff….On October 6th, Shekela welcomed the birth of her beautiful baby daughter. Congratulations to Mom and Daughter!!! On October 13th, Dr. Goodman, Abby, and Barb presented our office donation from the Smiles For Life Campaign in the amount of $3,050.00 to our local charity, The Marge Crispin Center, in Braintree. They were very excited to receive such a generous donation. They will be putting it to great use during the holiday season by supporting many familys with holiday food baskets and toys during the Christmas season. Thank you again to all our patients and staff who helped make this happen! We enjoyed a pumpkin decorating contest as well as a Halloween pot luck on October 21. Fun was had by all. Please visit our facebook page to see our great pictures capturing this event as well as our pumpkin winners. Employee of the month for September was Kathy Mcgee. Thank you, Kathy!! Hygiene Month was celebrated For October. Thanks to our wonderful Hygienists . .Kathy, Hong, Sochita and Karina for all that you do!!! We want to thank our team for all their hard work during the summer months. It is with their dedication and team work that Braintree maintains its goal of providing great care and comfort to our patients. As a result, our practice has welcomed many new patients for the month of August. Our employee of the month for July is Marianna. We want to thank her for all her hard work. Our August birthdays were Dr. Thaker and Dr. Townsend. They were celebrated with cakes for both and wished them many more birthdays to come. As the Fall arrives ,it is time to think about utilizing your insurance benefits before the end of the year. Please contact our office we can help schedule your treatment . A good laugh is known to help the immune system which is very important especially during the colder months. Smile, you just might make someone’s day!!!! July has come to an end. We celebrated staff appreciation day on Thursday 07/21/2016. The office Managers arrived early that morning and cooked an entire breakfast for the staff!!! Breakfast included pancakes, eggs, bacon, sausage, French toast, fresh fruits and assorted juices!! Later that afternoon an ice cream social was enjoyed by all. We are so happy to have such a hard working wonderful staff in Braintree :). We are so happy for the return of Dr. Thaker from her maternity leave on July 19th!! Our July birthday for the month was Shekela. Happy Birthday and Many More!!! With the end of the year fast approaching, Here are some tips in regards to knowing your Dental Insurance. Please take the time to read the information below. The maximum dollar amount that the insurance company will pay for your dental care in a benefit year. A dentist who has contracted with your insurance company. The dentist agrees to accept the insurance’s allowable contracted rates. The contracted allowable rate that the contracted dentist has agreed to accept as determined by the insurance company. A dollar amount that the patient must pay for covered services. Your insurance determines what type services the deductible will be applied. The dollar amount the patient is responsible for paying, such as co-payments, deductibles, non-covered services and any amount over the annual maximum. A reduced fee-for-service plan that allows enrollees to visit a Preferred Provider (dentist)this will minimize your out-of-pocket expense. Some patients have both a PPO and Non PPO insurance plan (In and Out of Network Plan) if both plan benefits are the same then it doesn’t matter who you see. Many PPO plans require you see a PPO dentist only. A period of time that the insurance company has determined a patient must wait before their insurance becomes active and are eligible for benefits under a specific insurance type category. When the insurance company will not provide any benefit coverage for that missing tooth. Generally, when the missing tooth occurred prior to having coverage with the dental insurance plan. When, there are two or more clinically acceptable dental procedure codes available, some insurance companies will apply what is called an alternate benefit. You are responsible for the additional charges beyond the allowance for the alternate service, even if using an in-network provider. For example: The alternative to a composite filling (white filling) is an amalgam filling (silver). The insurance will pay a benefit for the amalgam and the patient would be financially responsible for the difference between the two. This applies to what is considered as posterior (back) teeth. Some insurance companies apply an alternate benefit to crowns and other procedures. A list of procedure codes where your insurance company and your employer group determine a dollar amount attached to a specific procedure code. That dollar amount is what they are going to pay towards the treatment making the patient responsible for the difference of that dollar amount and the dental office fee for that specific procedure code. When we say insurance breakdown we are talking about what your insurance company has provided us regarding your coverage, via website, phone or fax. This breakdown provides us with the percentages of benefit coverage. We do not always see restrictions or non-covered services. We will only provide you with estimates. Ultimately, it is the responsibility of the patient to know what type of insurance benefit coverage is available to you. Your insurance contract is between you, your insurance company and/or employer group. We will try our best to help with any questions. Although, we suggest you always call your insurance company for answers to any questions regarding coverage. Please do not hesitate to call our office if you need any assistance in regards to your insurance benefits. Also read this post to understand dental plans and costs. The Smiles For Life Campaign has come to the end. Total donations for Braintree reached beyond our Goal of $5000 with the grand total of $ 7,450. Every dollar raised will benefit the charity organizations. Braintree’s local charity, The Marge Crispin Center will receive half the amount raised, $3725, and with Smiles for Life receiving $3725. We want to extend our appreciation to our wonderful and caring patients and staff that helped make this campaign a success. A special shout out to Dr. Townsend for his special effort for both charities! We are preparing for Dr. Thaker’s return on July 19th from Maternity leave. Please check out our face book page for pictures of the baby shower that the staff had for her in April. She has been missed by her Great Hill Braintree family. We are looking forward to her return. Happy Birthdays to our three June Birthdays!!! Barb B, Brittney R, and Hong S.
June was off to a great start. Our employee of the month for June is Shekela M. Thanks Shekela for all you do! Summer is finally here!!! Weather is warm, Days are long, Children have finished school and are on vacation. Now is a great time for your children’s cleanings. Please call the office to schedule now before the back to school rush in August. Also, you may want to check your treatment needs. Please contact our office and we can help you determine what are your remaining treatment needs and insurance savings and how best to keep your smile healthy. Until next month keep smiling. May was off to a great start. Congratulations to Kelley Parma, our Employee of the Month for April! Thanks Kelley for all you do. We wished Sandy, Happy Birthday, on May 17Th. Our Smiles for Life fundraising campaign has been alot of fun. We hit 50 donations and Dr. Goodman got pied in the face!!! Dr. Goodman has been a great sport and has agreed to be pied again when we reach 50 donations. Please visit our Facebook page to see the event!! Dr. Townsend has also agreed to wear a TUTU once we reach 50 donations!! So, please stay tuned. This has been a wonderful fundraiser. 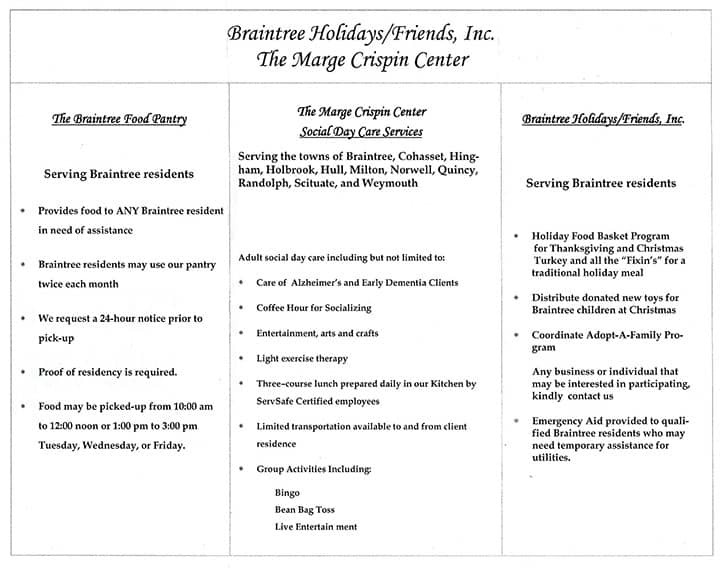 We are looking forward to making a donation to the local charity “Marge Crispin Center” in Braintree. Thank you to our awesome patients for making this possible. We are looking forward to making a donation to the local charity “Marge Crispin Center” in Braintree. Thank you to our awesome patients for making this possible. Please enjoy the beautiful weather. Smile, you may just make some ones day Laughing. April is here!! Braintree is very excited to welcome Dr. Thaker’s new Baby Boy! He made his arrival on Friday April 8th. He weighed in at 8lbs 2 ozs. and 20 inches long. Congratulations to Dr. Thaker and her family!! Administrative Professional day was on April 27th. A big Thanks goes out to Kelley and Sandy these girls multi task all day long with insurance, patient scheduling and questions. All with a smile on there faces and its a “my pleasure”. Great Hill would not be able to do it with out them!! Summer is fast approaching please not hesitate to call us. We will be able to help you achieve the smile you always wanted. Dr. Salem our Orthodontist would be more than happy to show you what can be done through orthodontics. This will enable you to get your braces or invisalign done during the summer months. Smiles for life is still going strong we did reach 25 donations. Dr. Goodman will be getting pied!!! We will be posting a video to our face book page SOON!!! 25 more donations Dr. Townsend will be wearing ,the TUTU!!! We have raised $1,490 to date. The month is coming to a end. You may want to be thinking to brighten your smile do not hesitate to call us a beautiful white smile will brighten your day!! Abby and Barb attended a Managers Conference on April 22nd and 23rd. They were able to bring back lots of new ideas to the office. Birthday wishes the month April go out to Dr.Irwin, Kathy M, and Marianna S.
We welcomed Rachel to our Great Hill Dental Family. She has joined our Dental Assistant team. We could not be happier. See you next month. March was another busy month for Great Hill Dental Partners, Braintree! We celebrated Lana’s birthday on March 29th. Also, in March, we had our inaugural Jelly bean contest. The winners had to guess the number of jelly beans in a vase at our reception desk. Our Children’s winner was Christopher C. who received a children’s Oral B electric tooth brush. Our adult winner was Judith D., the proud winner of a take home bleaching kit. The staff had some fun on March 25th we had an employee egg hunt!! The two employees that found the most eggs received a Dunkin Donuts gift card. See our Facebook page for our winners, Shekela and Lorena. Our office participated in the 2016 Health and Wellness Fair on March 25 at the Quincy YMCA. Barb, our Assistant Manager and Dr. Goodman, our Clinical Site Director, attended. Children were able to interact with Dudley, our children’s tooth brushing Dinosaur. Dr. Goodman answered several questions relating to periodontal disease and how it effects your overall systemic health. We raffled a Sonicare electric tooth brush and the excited winner was Mary F.
Our Smiles For Life Campaign is going strong. Total raised for charity to date is $790. A huge Thank You to all our patients that have contributed. Only 13 more contributions and Dr. Goodman will be Pied!!!! Rachel finished her internship on March 30th. We had a nice luncheon to show our Appreciation. We hope in the nearest future Rachel will be able to joining our Great Hill Dental Partners Family in Braintree. Here we are in the first 2 weeks in March. Spring is right around the corner. We celebrated Dental Assistant Week March 2nd through March 9th. We wish to thank our wonderful Dental Assistants for all there hard work. Please see our face book page to see pictures of our assistants being honored. We also celebrate 2 Birthdays this month: Katherine Shaunessy and Kelley Parma. Happy Birthday!! Our Office is very excited to be kicking off a wonderful campaign called “Smiles For Life”. Patients make a donation to Smiles for Life and they receive a dental tooth whitening kit. 100% of the donated funds will be distributed 50/50. Half of the funds will be donated to a local charity in Braintree, The Marge Crispin House. The remainder is donated to “Smiles For Life” which provides much needed dental care to children in the Dominican Republic, Bolivia, and Guatemala. Also, Dr.Goodman has agreed to be pied “which is a cream pie in his face” after 25 smiles. After we whiten 50 smiles, Dr. Townsend has agreed to dress up as the Tooth Fairy and have his picture posted on our Face Book Page. We especially wish to thank our generous patients for their donations. The last 2 weeks of February have been very busy for Braintree office. We had our first Employee Cup Cake Challenge on Friday, February 12. We had many great employee entries. Everyone had fun whether tasting the entries or voting. Thank you to our patients that day who voted on the entries. The 3 category’s where: Presentation, Creativity, and Taste. Please see our Facebook page for the winners. February is Dental Health Month and we visited Children of America PreSchool in Holbrook. Dudley, our tooth brushing dinosaur was a hit. We discussed healthy vs. non-healthy snacks. The children were able to interact with Dudley by taking turns brushing his teeth. They had a lot of fun and got to practice their own techniques. Winter snow has finally arrived with back to back storms bookending the first weekend in February. Great Hill Dental Partners – Braintree was open to provide care and comfort to our patients. Thank you to our awesome patients who did brave the weather and come out for their appointments!!! February is National Children’s Dental Month. Our office will be visiting Children of America in Holbrook on February 22nd with Dudley our tooth teaching Dinosaur. The children and staff are very excited to have us back. Happy New Year! January has been a very busy month for Great Hill Dental Partners of Braintree. We are excited to continue our Progressive Periodontal Therapy Program which aims to address the link between oral health and systemic health. If you have any questions, please ask any of our team members. The New Year has brought with it several changes to our dental team. Please welcome hygienist, Hong. She has been a team member at our One Brigham Circle location and joins our practice on Wednesdays, Thursdays, Fridays and alternating Saturdays. She is a wonderful addition to the Braintree Team. Also, our practice provides educational externship opportunities for a local dental assisting program. Please welcome Rachel, who joins our team on externship. Sadly, hygienist, Ashley, has left our practice to pursue an exciting opportunity. We wish Ashley best wishes with her new position. She will be missed by all. As January comes to a close we look forward to February. Welcome to our Great Hill Dental Braintree Office Blog! Wow 2014 is off and running! While the snow has been falling we have been keeping busy. First of all we would like to congratulate Dr. Thaker on having her baby Ari and also welcoming her back to work. We would also like to congratulate Ashley Nunes on her baby daughter Aubrey who was born in December. Without losing a beat Dr. Thaker was back to work and she and Barb spent time visiting and educating doctors and staff at Milton Pediatrics as well as the HVMA Quincy practice. Plans are to attend the South Shore Chamber of Commerce Winter Fest at the end of February as we are a sponsor for the event! Welcome aboard Kerry Smith, she is a new addition to the practice as a Patient Access Rep. We look forward to having you as part of the team. Congrats to Shekela Mason, dental assistant as she earned the first Employee of the Month award in Braintree. Wear your Championship Belt Proud! Thanks for all your hard work and your willingness to constantly learn and strive to improve. You always make patients comfortable and show you care!